…I just received an sms message from him and he says to say hello to you all!! Due to bad weather…FOG… in KSU, they are still at Gardermoen…and that’s after having to first travel to Molde by bus and then fly from there! But they didn’t get their flight Gardermoen to Paris and so re-booked via Arlanda and Frankfurt!!!! So now due to arrive in Paris at 11pm tonight. Oh no, what a start! But like you say, this is bound to lead to a few extra and unexpected photo opportunities! Well thankfully they have got the extra few hours on Sunday to make up for today's loss. May their break be free from further unscheduled excursions! Just had a couple of shrimp sandwishes and beers at the 'Seafood Bar' at Gate 42 in the GM abroad wing. For anyone who want to follow my tour, I will fly Gm to Arlanda at SK496, then SK673 from Arlanda to Frankfurt, and finally LH1050 from Frankfurt to Paris. Last edited by Sterkoder; September 30th, 2011, 14:27. NEVER choose seat 32E on board a MD-82!!! Last edited by Sterkoder; September 30th, 2011, 21:11. 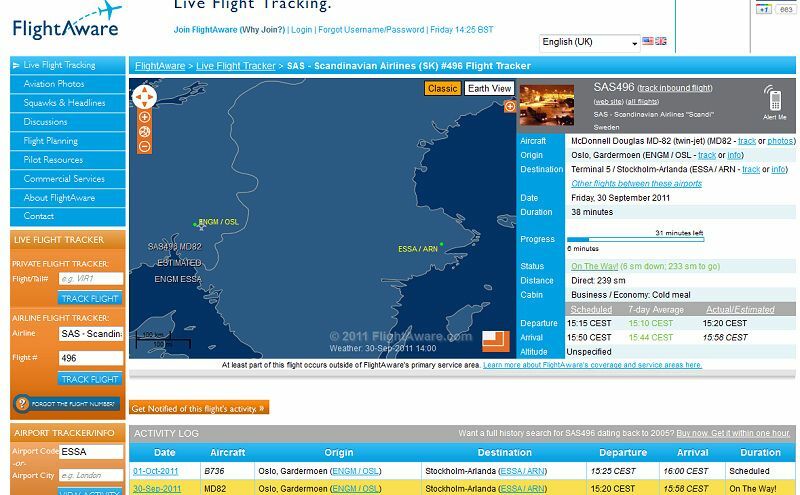 Well, it seems our dear Big S managed to get some internet access at OSL, and with the flight numbers now confirmed, I for one will most certainly be trying to keep track of his journey throughout the day. As was alluded to in a holiday thread of pakarang’s recently, shrimps are always something I would like to eat, and so I think I shall forever think fondly and affectionately of “shrimp sandwishes” …rather than the impossibly difficult English spelling sandwiches…in future. Smile of the Day, definitely! Svein, in case you are able to read here on your iPhone but not reply, may I send you both my Very Best WISHES for your continuing journey. And indeed, by the time I had typed the above, they are on their way to Sweden! Rebooked to LH1052, departure FRANKFURT 21:35 local german time. Oh no! Don't tell me you got the engines for comfort! Eeeek! (Not many pictures taken today, I can assure you). Had to miss following the actual arrival due to that final re-booking...but I was more or less following you around all day...hope having some virtual CV travelling buddies along was cheering......but now off you go and soak up the Parisian atmosphere you two, and have yourselves an absolutely great (and romantic time). Or maybe a bit too close to the galley? This is hilarious!!!! I mean, not the rebooking part--but the stalking!